Home » Comics » September Mourning in January 2019 – Honest! September Mourning in January 2019 – Honest! Bestselling writers David Hine, Mariah McCourt (editor of Emily the Strange, The Last Unicorn), and metal singer/songwriter sensation Emily Lazar (aka: September Mourning) team up with artist Tina Valentino to tell the story of a human grim reaper hybrid and her destiny in September Mourning. Issues #1-4 of the ongoing series, which first launched through Kickstarter, will be collected into trade paperback and available from Image/Top Cow Productions this January. In conjunction with the release of this book, September Mourning will be releasing new music via Sumerian Records, which will bring further life to the storyline. 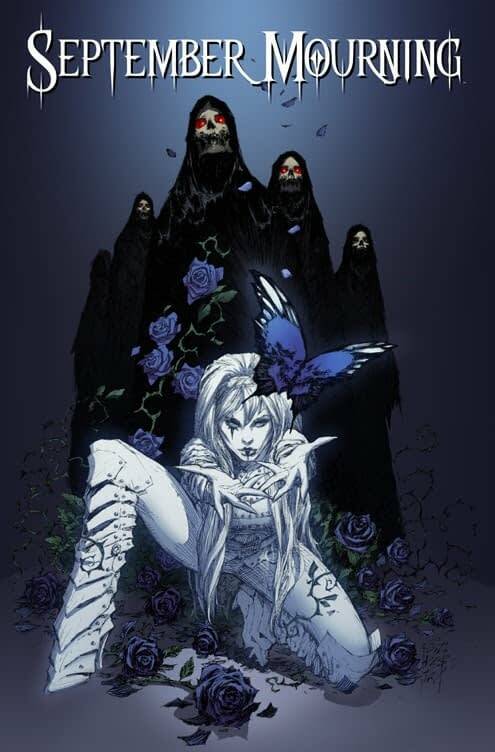 Created by Top Cow founder/artist Marc Silvestri and musician/singer Emily Lazar of the band September Mourning, M Lazar, was created as a unique character who lived in multiple worlds and media: a rock band, social media, and now a comic book series. September Mourning has no past that she can remember, only a strange and shadowy present filled with the voices of the dead. Turned into a unique hybrid by the former Reaper of the lonely, injured and abused, September Mourning is the only human/reaper to exist. Back in 2011, David Hine was writing a new comic book series to be drawn by Michael Broussard and published by Top Cow as well as series of webisodes that would have broadcast by MTV. December 2011 was the intended release date. But in 2015 the September Mourning Top Cow comic was successfully crowd funded on Kickstarter, to be written by Mariah McCourt of Emily and the Strangers. And drawn by Sumeyye Kesgin, of Top Cow’s Rise of the Magi series. And that happened. The first two issues of the comic were recently collected to coincide with a September Mourning tour. And now David Hine is returning to write the next two issues of the comic. And finally Image/Top Cow are publishing the title. SEPTEMBER MOURNING, VOL. 1 (ISBN: 978-1-5343-1030-8) hits comic shops on Wednesday, January 16th and bookstores on Tuesday, January 22nd.